What is Unique B-12 Vegetarian Formula? 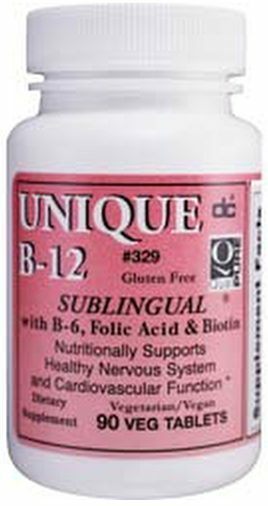 Unique B-12 is a highly absorbable vegan-friendly and gluten-free formula that contains B-12 (methylcobalamin), B6, Folic Acid and Biotio in a sublingual tablet. Unique B-12 Vegetarian Formula is specifically formulated to bypass the digestive system providing the B vitamins directly to the bloodstream. Approximately 30% of adults over 50 are unable to absorb B-12 in food, making supplementation the best source. A University of Oxford research study indicated that vitamin B-12 deficiency may lead to brain shrinkage. While B-12 supplementation is not a cure for Alzheimer's disease, preliminary reports indicate a link between vitamin B-12 deficiency and Alzheimer's disease. Vitamin B-12 deficiency leads to megaloblastic anemia, a fatigue ridden condition where red blood cells are unable to develop sufficiently and unable to carry oxygen efficiently. Why is Unique B-12 the Best Vitamin B-12 Complete Supplement? Contains methylcobalamin which is the bioavailable, coenzyme forms of B-12. Highly bioavailable and absorbable and bypasses the digestive system. Unique B-12 Vegetarian Formula is formulated to optimize absorption of all four ingredients. Taking vitamin B-6 is a strategy recommended by many experts to help increase the amount of vitamin B-12 your body is able to absorb. Unique B-12 is provided in great tasting sublingual tablet for fast absorption -- no injections. Vegetarian and vegan friendly, GMO and gluten free! Rimm EB, Willett WC, Hu FB, et al. Folate and vitamin B6 from diet and supplements in relation to risk of coronary heart disease among women. JAMA. 1998; 279:359–364. He K, Merchant A, Rimm EB, et al. Folate, vitamin B6, and B12 intakes in relation to risk of stroke among men. Stroke. 2004; 35:169–174. Ishihara J, Iso H, Inoue M, et al. Intake of folate, vitamin B6 and vitamin B12 and the risk of CHD: the Japan Public Health Center-Based Prospective Study Cohort I. J Am Coll Nutr. 2008; 27:127–136. Larsson SC, Mannisto S, Virtanen MJ, Kontto J, Albanes D, Virtamo J. Folate, vitamin B6, vitamin B12, and methionine intakes and risk of stroke subtypes in male smokers. Am J Epidemiol. 2008; 167:954–961. Forman JP, Stampfer MJ, Curhan GC. Diet and Lifestyle Risk Factors Associated With Incident Hypertension in Women. JAMA. 2009; 302:401–411. Forman JP, Rimm EB, Stampfer MJ, Curhan GC. Folate intake and the risk of incident hypertension among US women. JAMA. 2005; 293:320–329. Toole JF, Malinow MR, Chambless LE, et al. Lowering homocysteine in patients with ischemic stroke to prevent recurrent stroke, myocardial infarction, and death: the Vitamin Intervention for Stroke Prevention (VISP) randomized controlled trial. JAMA. 2004; 291:565–575. Lonn E, Yusuf S, Arnold MJ, et al. Homocysteine lowering with folic acid and B vitamins in vascular disease. N Engl J Med. 2006; 354:1567–1577. Bonaa KH, Njolstad I, Ueland PM, et al. Homocysteine lowering and cardiovascular events after acute myocardial infarction. N Engl J Med. 2006; 354:1578–1588. Albert CM, Cook NR, Gaziano JM, Zaharris E, MacFadyen J, Danielson E, Buring JE, Manson JE. Effect of folic acid and B vitamins on risk of cardiovascular events and total mortality among women at high risk for cardiovascular disease: a randomized trial. JAMA. 2008; 299(17):2027-2036. Lee M, Hong KS, Chang SC, Saver JL. Efficacy of homocysteine-lowering therapy with folic acid in stroke prevention: a meta-analysis. Stroke. 2010; 41:1205-1212. Yang Q, Botto LD, Erickson JD, et al. Improvement in stroke mortality in Canada and the United States, 1990 to 2002. Circulation. 2006; 113:1335–1343. VITATOPS TSG. The VITATOPS (Vitamins to Prevent Stroke) Trial: rationale and design of an international, large, simple, randomised trial of homocysteine–lowering multivitamin therapy in patients with recent transient ischaemic attack or stroke. Cerebrovasc Dis. 2002; 13:120–126. Galan P, de Bree A, Mennen L, et al. Background and rationale of the SU.FOL.OM3 study: double–blind randomized placebo–controlled secondary prevention trial to test the impact of supplementation with folate, vitamin B6 and B12 and/or omega–3 fatty acids on the prevention of recurrent ischemic events in subjects with atherosclerosis in the coronary or cerebral arteries. J Nutr Health Aging. 2003; 7:428–435. Bowman L, Armitage J, Bulbulia R, Parish S, Collins R. Study of the effectiveness of additional reductions in cholesterol and homocysteine (SEARCH): characteristics of a randomized trial among 12064 myocardial infarction survivors. Am Heart J. 2007; 154:815–823, 823 e1-6. Bostom AG, Carpenter MA, Kusek JW, et al. Rationale and design of the Folic Acid for Vascular Outcome Reduction In Transplantation (FAVORIT) trial. Am Heart J. 2006; 152:448 e1–7. Giovannucci E, Stampfer MJ, Colditz GA, et al. Multivitamin use, folate, and colon cancer in women in the Nurses’ Health Study. Ann Intern Med. 1998; 129:517–524. Zhang S, Hunter DJ, Hankinson SE, et al. A prospective study of folate intake and the risk of breast cancer. JAMA. 1999; 281:1632–1637. Larsson SC, Giovannucci E, Wolk A. Folate and risk of breast cancer: a meta-analysis. J Natl Cancer Inst. 2007; 99:64–76. Ericson U, Sonestedt E, Gullberg B, Olsson H, Wirfalt E. High folate intake is associated with lower breast cancer incidence in postmenopausal women in the Malmo Diet and Cancer cohort. Am J Clin Nutr. 2007; 86:434–443. Ulrich CM. Folate and cancer prevention: a closer look at a complex picture. Am J Clin Nutr. 2007; 86:271–273. Cole BF, Baron JA, Sandler RS, et al. Folic acid for the prevention of colorectal adenomas: a randomized clinical trial. JAMA. 2007; 297:2351–2359. Zhang SM, Cook NR, Albert CM, Gaziano JM, Buring JE, Manson JE. Effect of combined folic acid, vitamin B6, and vitamin B12 on cancer risk in women: a randomized trial. JAMA. 2008; 300:2012–2021. Mason JB, Dickstein A, Jacques PF, et al. A temporal association between folic acid fortification and an increase in colorectal cancer rates may be illuminating important biological principles: a hypothesis. Cancer Epidemiol Biomarkers Prev. 2007; 16:1325–1329. Sanjoaquin MA, Allen N, Couto E, Roddam AW, Key TJ. Folate intake and colorectal cancer risk: a meta-analytical approach. Int J Cancer. 2005; 113:825–828. Ferrari P, Jenab M, Norat T, et al. Lifetime and baseline alcohol intake and risk of colon and rectal cancers in the European prospective investigation into cancer and nutrition (EPIC). Int J Cancer. 2007; 121:2065–2072. Pfeiffer CM, Caudill SP, Gunter EW, Osterloh J, Sampson EJ. Biochemical indicators of B vitamin status in the US population after folic acid fortification: results from the National Health and Nutrition Examination Survey 1999–2000. Am J Clin Nutr. 2005; 82:442–50. Institute of Medicine. Dietary reference intakes for thiamin, riboflavin, niacin, vitamin B6, folate, vitamin B12, pantothenic acid, biotin, and choline. Washington, DC: National Academy Press, 1999. Wei EK, Giovannucci E, Selhub J, Fuchs CS, Hankinson SE, Ma J. Plasma vitamin B6 and the risk of colorectal cancer and adenoma in women. J Natl Cancer Inst. 2005; 97:684–692. Lee JE, Li H, Giovannucci E, et al. Prospective study of plasma vitamin B6 and risk of colorectal cancer in men. Cancer Epidemiol Biomarkers Prev. 2009; 18:1197–1202. Why is B-12 absorption a concern for some people? B-12 is the largest vitamin known and difficult to absorb. Additionally, the gut produces something called intrinsic factor, this helps the body absorb B-12. Without intrinsic factor, B-12 just exits the body. As we age, the availability of intrinsic factor decreases and the risk for B-12 deficiency increases. Everyone! Some people, more than others, need to pay special attention to their B-12 levels. Those who drink alcohol, take antibiotics, use antacids, smoke, vegetarians and vegans, have trouble sleeping, pregnant and breast-feeding women, the elderly, people who have celiac disease or have difficulty digesting gluten and absorbing nutrients, and people who are affected by harmful organisms may all be advised to keep their B-12 levels in good range. Homocysteine levels are an independent stressor on the cardiovascular system and can be responsible for poor heart and cardiovascular health. The vitamin B6 and folic acid in Unique B-12 Vegetarian Formula work synergistically with vitamin B12 to promote normal homocysteine levels.